The doors to London’s most anticipated luxury tea emporium, Mariage Frères are now open, bringing tea savoir-faire to the capital in a beautiful five-storey listed Georgian townhouse on Covent Garden’s King Street. Step inside and Mariage Frères’ meticulous attention to detail, and commitment to quality, is evident in every detail and product, from the elegant retail space and restaurant, specialising in tea gastronomy, through to the two private events spaces and the tea museum. 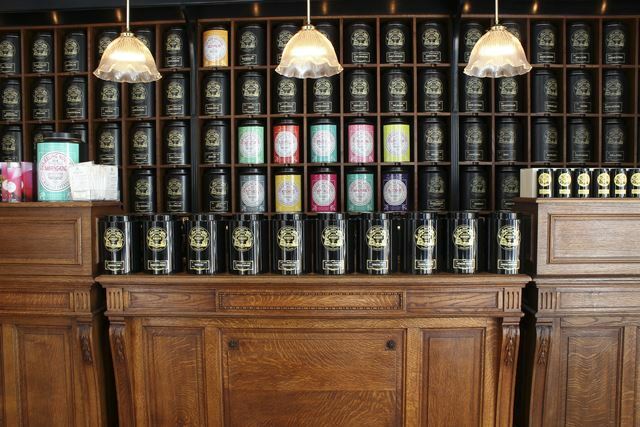 THÉ Mariage Frères continues to set the standards in luxury teas offering an unrivalled and the largest collection of tea in the world from its apothecary-style wall, stretching to over 1,200sqm. Organised like the grandest of wine cellars with exceptional crus composed of subtle and sophisticated blends, all are available by the weight from antique black canisters. Discover 1,000 aromatic varieties from 36 tea-producing countries with white, yellow, green, blue, black and red teas sitting alongside fruit teas, vintage varieties, unique harvests and the brand’s signature Marco Polo blend. Unique and specifically blended for Mariage Frères first London store is the Covent Garden Morning – a luminous black morning tea with aromatic notes of hazelnut. Recognising the 19th century roots of the brand, more than 150 years later Mariage Frères continues to offer a traditional and artisan approach to tea-making. Tea specialists, dressed in white-linen, are on hand to offer customers expert advice before they purchase their chosen blend from the vintage cashier booth, recreated in the style of the original stations manned by the Mariage brothers back in 1854. Other products, including seasonal collections, all beautifully packaged in an eye-watering array of jewel-like colours, include an assortment of tea-flavoured and tea-scented items such as signature fragrances, incense and candles as well as confectionary, gift sets, distinctive teapots and teacups, books, strainers and tea paraphernalia. 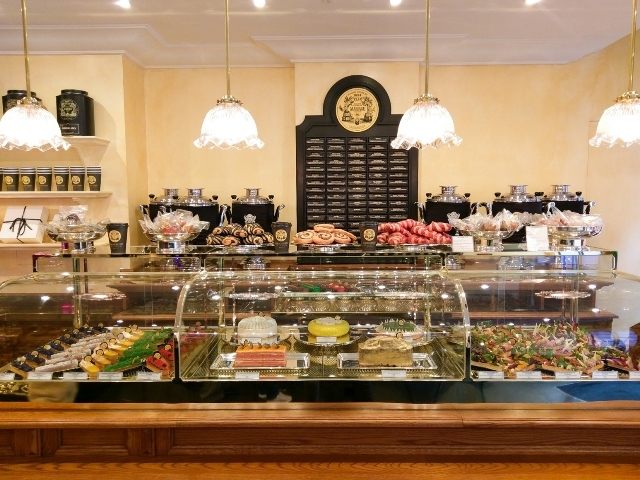 For those looking for a luxury grab-and-go experience or to elevate lunch al desko, Mariage Frères offers over 50 types of freshly brewed tea alongside the most beautiful looking, freshly prepared open sandwiches, sweet and savoury pastries. Open for breakfast, brunch, lunch, afternoon tea and dinner, Mariage Frères’ unique Cuisine au Thé concept runs throughout the menus, using tea as a delicate ingredient, spice or flavouring in every dish. Light and contemporary dishes include avocado guacamole-style with Japanese Matcha green tea and sweet potato crisps; seared Thai-style beef tartar seasoned with Lune Rouge tea, honey soy sauce, ginger, cashew and toasted sesame; veal with Jasmin Bohème tea; roasted chicken with smoky Black Léopard Tea jus; and Saumon Matcha with sautéed spinach, Siam rice and barberries. Tea-infused desserts are a delicious work of art with the likes of Rouge in Love with Paris Over the Rainbow rooibos tea-candied strawberries with cream, bourbon vanilla shortbread and French meringue; and a decadent Carré D’Or, a 24-carat dessert of dark chocolate covered with Black Magic Tea and 24-carat gold leaves. All-day brunch is served every day and is an integral part of the Mariage Frères menu with Parisien set meals, all featuring freshly squeezed orange or grapefruit juice, toasted brioche with Gelées Extra de Thé and Aquitaine butter; a tea-infused dessert, choice of tea and a Mariage cocktail or glass of champagne. 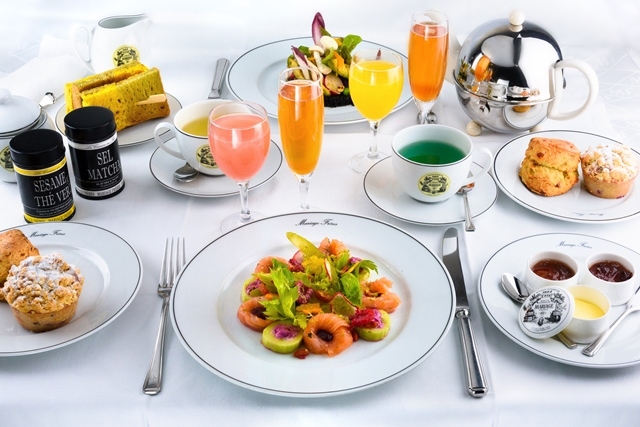 Enjoy with scrambled eggs seasoned with Sel Matcha, artisan marinated smoked salmon and shrimp, Japanese matcha green tea fromage frais with herb and pomegranate-glazed salad; or roasted, braised and confit of vegetables in I Have a Dream tea. The afternoon teas are a must try with a variety on offer including the King Street Afternoon Tea with a choice of savoury amuse bouche and pastries; or enjoy a warm freshly baked Parisien fruit scone with Mariage Frères Gelées de Thé. The Musée du Thé on the second floor showcases tea antiques from around the world enriched by the Mariage Frères family’s personal collection from their years travelling at sea. Hand-illustrated oak and beech tea chests, pewter tea boxes, Chinese furniture made of carved wood, caddies, cannisters, teapots, old archives and an array of curiosities line the walls, providing a fascinating insight into the history of tea. SALON PRIVÉ For private events and tea tastings, two private rooms, accommodating up to 30 seated and 50 standing, one with its own terrace; are available.